You know the drill in Ajax — it’s hard to get where you need to go without a car. Lucky for you, getting bad credit auto financing is easy. Our car loan service helps Ajax drivers get the loans they need to get on the road. Fill out an application, get approved, and choose your car from one of the registered Ajax dealerships in our network. It’s that simple. Bad credit or no credit? You can still get a loan in Ajax. Access to the most competitive rates in Ajax. No charge. Just apply and wait for approval. I went bankrupt and have (really) bad credit. Can I still get a car loan at LowestRates.ca? Yes. The main purpose of our car loan service is to serve Canadians with bad credit or no credit. We will connect you with an Ajax dealership capable of processing your car loan application. I just moved to Ajax from another country. Am I able to get a car loan? Yes. We can get you a loan in Ajax or anywhere else in the Greater Toronto Area even if you have no Canadian credit score. The dealers in our network specialize in bad and no credit auto loans. Of course. We work with all Ajax drivers, regardless of their driving experience. What do I need to qualify for a car loan in Ajax? You need to be employed and earn a minimum income of $1,500 per month. You also need to be 18 years or older, a resident of Canada, and have a valid driver’s license. How much tax do I have to pay on a vehicle purchased in Ajax? The Harmonized Sales Tax (HST) is 13% in Ajax (and the rest of Ontario). Remember to include this amount in your car-buying budget. Long car loans result in smaller monthly payments spread out over a greater duration of time. Short car loans do the exact opposite: your principal balance (plus interest) is divided into larger payments over a more compressed duration of time. 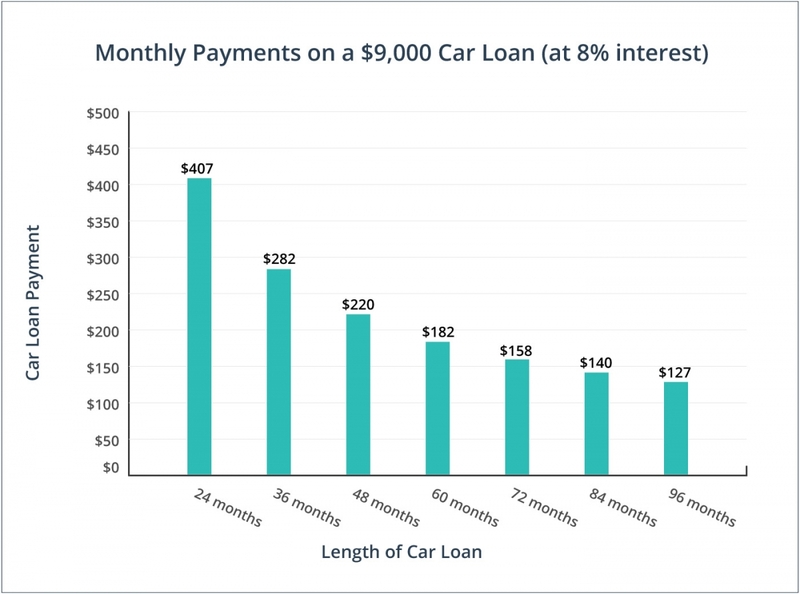 Check out the graph below to compare monthly payments on short and long car loans. You can’t shop for your new ride until you know your budget, so spend time negotiating the details of your car loan first: what loan amount are you approved for, what interest rate can you get, and how long will your loan be? The purchase price of the car is just one expense to consider. There’s also maintenance, fuel economy, repairs, and, of course, car insurance. Research the cost of operating a vehicle before you buy it and compare insurance rates online. Attention all Ajax car buyers: if you can afford bigger monthly payments, you should opt for a shorter car loan. With a short loan, you’ll pay less interest and get rid of your loan in less time. Registered dealerships follow a variety of rules and regulations set out in Ontario’s Motor Vehicle Dealers Act. If you buy from a private seller, you won’t be able to take advantage of those protections. I can’t get a car loan in Ajax if I have bad credit. False. If you have bad credit or no credit, our car loan service is designed with drivers like you in mind. I can use my car loan to buy a vehicle wherever I want. False. Our car loan service connects you with one dealership in your area. They provide you with the financing to purchase a vehicle from their lot. The Motor Vehicle Dealers Act only protects new car buyers. False. If you buy a used vehicle from a registered dealership, you’re entitled to the protections provided under the Motor Vehicles Dealers Act. Dealerships have a ‘cooling off’ period for used car sales. False. There’s no cooling off period for used car sales in Ajax or anywhere else in Ontario. Dealerships don’t offer return policies and are under no obligation to give you a refund — even if they are registered. Interest rates on bad credit auto loans are extremely high. False. While interest rates on bad credit loans are higher than on standard car loans, you’ll still be able to find a reasonable rate on our site. Bad credit car loans don’t have to be small. Depending on your financial profile, our Ajax dealers offer loans of up to $40,000. The Ontario Motor Vehicle Industry Council requires dealers in Ajax (and the rest of Ontario) to clearly indicate if HST and license fees are not included in the vehicle’s advertised purchase price. You can travel on the 407 toll road extension for free until the end of 2016. That means drivers can use the new part of the toll road — which runs across the north end of Ajax — without worrying what it will cost. Ajax has the ignominious distinction of having the worst intersection for fender-benders in the entire Durham region— at Brock Road and the 401. After you’ve received your car loan and gotten behind the wheel, be extra careful at this intersection. You can get charged up in Ajax. The city now has 3 charging stations for electric cars, although the only station open to all vehicles and all brands is located at the Rouge Valley Ajax Pickering Hospital on Harwood Avenue.